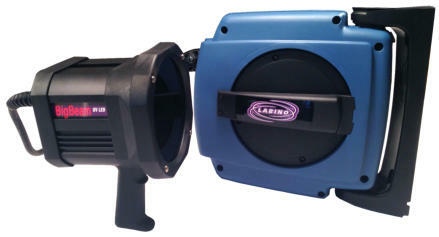 The Labino BB Series - UV LED Light - BB Helios & BB Ikaros. 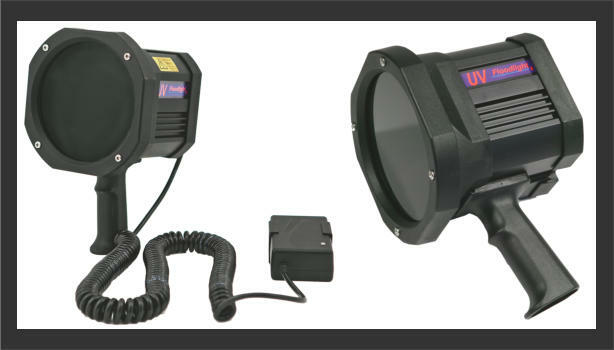 Powerful UV LED Lights that produces a large beam, useful for covering large areas, widely used either in the field, on an MPI Bench or a penetrant line. BB Series products Helios & Ikaros BB Series products Helios & Ikaros are lights with a powerful and wide UV Output. They provide large coverage and weigh less than many comparable products. The mains operated model weighs just 1.2 kg (2.6 lbs) and the battery operated model weighs just 1.7 kg (3.7 lbs). They are widely used for field inspections or on an MPI bench. BB Series lamps have an ingress protection marking of IP65. The BB Series family of products has been specifically designed to meet the ASTM E3022-15 and ISO 3059-12 standards as well requirements set by the PRIMES. The optics used in the BB Series meet the Rolls-Royce RRES 90061 specification. The beam profile of the UV light is extremely homogeneous without any footprints showing from the LED’s, shades, dark spots or other disturbing defects. NDT professionals worldwide recognize BB series qualities, making it Labino’s best-selling product for many years in a row. This lamp is based on LED technology and offers you a very narrow spectra with a peak wavelength of 365nm. Each unit consists of 9 ultraviolet LEDs. Each LED’s life is estimated at 30,000 hours. All electronics as well as the LEDs are placed in a single rugged housing with the diameter not exceeding 15.5cm (6.1 inches). In all BB models the start function provides full power instantly. This product is IP65 approved for dust and water jet. The BB series are 100% free from UV-B and each unit is equipped with a white light block filter which helps the lamp emit almost no visible light. Each unit is provided with a certificate of compliance depending on your choice of model. Your Choice • Version: BB HELIOS or BB IKAROS • Power Source: All BB models are available as Battery and Mains (DUO) or just Mains. The DUO is battery operated, but it is possible to run the unit via mains while charging the battery. The battery has a running time of 3.5 hours (+/- 5%). Each DUO unit is equipped with a current regulator to keep the intensity steady when the battery fades. The mains model is equipped with a 2 meter long extendable cord although it is possible to order a longer customized version of your choice or alternatively buy a BB on a Cable Winder for convenience. Total weight of the DUO model is 1.7 kilos (3.7 lbs) and of the Mains model 1.2 kilos (2.6 lbs). Both models (DUO and MAINS) come with a pistol handle as standard. Mounting brackets for fixed installations are optional. • Accessories: Add a carrying case, a cable winder or a friction arm for your convenience. 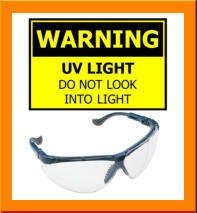 A UV Block visor is recommended for your protection. 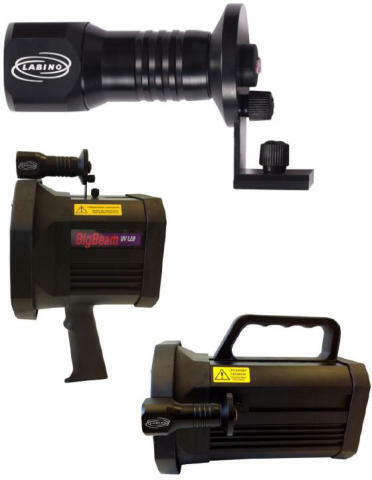 BB Series products Helios & Ikaros BB Series products Helios & Ikaros are lights with a powerful and wide UV Output. They provide large coverage and weigh less than many comparable products. The mains operated model weighs just 1.2 kg (2.6 lbs) and the battery operated model weighs just 1.7 kg (3.7 lbs). They are widely used for field inspections or on an MPI bench. BB Series lamps have an ingress protection marking of IP65. The BB Series family of products has been specifically designed to meet the ASTM E3022-15 and ISO 3059-12 standards as well requirements set by the PRIMES. The optics used in the BB Series meet the Rolls- Royce RRES 90061 specification. The beam profile of the UV light is extremely homogeneous without any footprints showing from the LED’s, shades, dark spots or other disturbing defects. NDT professionals worldwide recognize BB series qualities, making it Labino’s best-selling product for many years in a row. This lamp is based on LED technology and offers you a very narrow spectra with a peak wavelength of 365nm. Each unit consists of 9 ultraviolet LEDs. Each LED’s life is estimated at 30,000 hours. All electronics as well as the LEDs are placed in a single rugged housing with the diameter not exceeding 15.5cm (6.1 inches). BB Helios has been tested to comply with both ASTM E3022-15 and ISO 3059- 12 standards. It generates an intensity of approximately 8,500 µw/cm² (85W/m2) at 38cm (15 inches). The running time of the battery is 3.5 hours (constant use). EnLiten White LED After Inspection Light (add on optional accessory) Labino’s mission is to improve the working environment of the operative NDT engineer and create precise instruments that helps identify the defects. Labino now offers the first white light LED for after inspection especially designed for Standard Labino MPXL lights and all versions of the Labino BB range. The Labino EnLiten (L2001) is a small-sized, Lightweight white light LED lamp designed to be mounted on a Labino MPXL lamp or Labino BB. The Labino EnLiten is designed to be used as an after inspection light (to search for indications) performing NDT. The EnLiten lamp is easy to mount on your existing Labino BB or Standard MPXL light as it easily slides into one of the tracks on the side or on the top of the Lamp. The small white light accessory lamp is easily mounted on the MPXL or BB in a few minutes. The Labino EnLiten contains one(1) light emitting diode (LED). The LED creates more than 300 Lux (27.9 foot Candle) at a distance of 38cm (15 inches).Full power is reached instantly. The on/off button is positioned in the back of the lamp for easy activation. At full charge the battery provides up to 1.5 hours of use. Recharge from a normal outlet with the included chargers. (approx. 2hours). Weight including battery 121 grams.